Students fill the four-story, 85,000-square-foot Library/Learning Resource Center during the first week of school. The official ribbon-cutting ceremony is scheduled for Friday, Feb. 22. 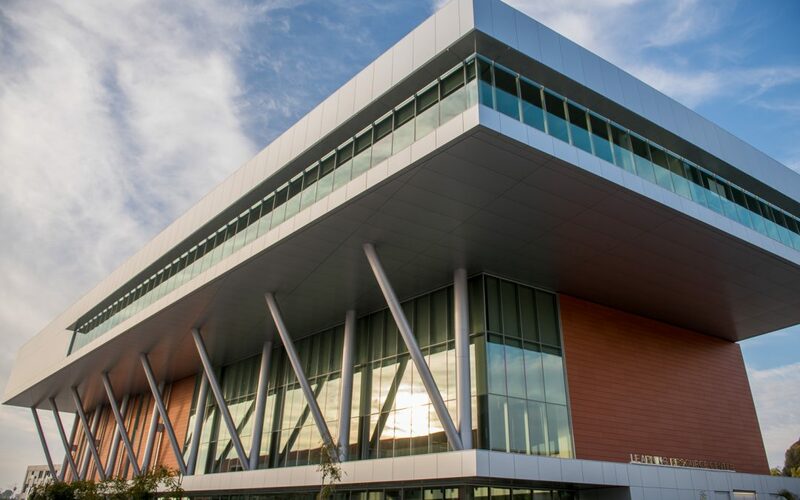 SAN MARCOS, CA ― From the stunning fourth-story views to state-of-the-art computer labs to reference desks, book stacks and cozy study nooks on every floor, the new Library/Learning Resource Center (LRC) at Palomar College was bustling with students during the first week of the Spring 2019 semester. The first week of school was also the facility’s long-awaited campus debut, after library and facilities staff spent the holiday break putting the finishing touches on and moving into the building. At 85,000 square feet and four stories tall, the structure is a striking new presence on a campus that has been transformed over the last decade, with the implementation of Prop. M, the $694 million ballot measure approved by voters in 2006. The ceremony, scheduled for 2 p.m. on Friday, Feb. 22, 2019, will be held on the plaza in front of the new building, with refreshments and remarks by Palomar College officials, as well as tours for guests.